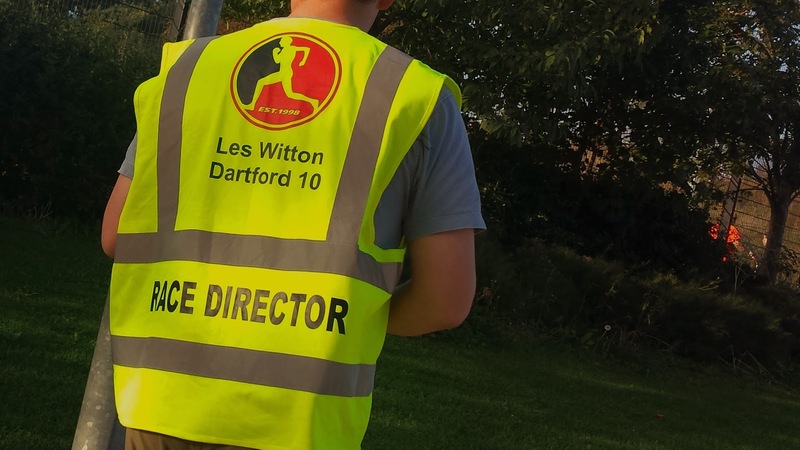 The Les Witton Dartford 10 mile road race is hosted by Dartford Road Runners (they also host the brilliant Joydens Wood 5k series) and has been part of the race calendar for at least 12 years (that's as far back as the runners world reviews go). The 2014 race was originally scheduled to take place on 19 January, but due to flooding around the start/finish area had to be postponed at the very last minute. However, this wasn't the first time it had run into trouble; the last few years had all suffered from one thing or another. I had heard a rumour that the race would be rescheduled for September, so I kept the month free of any other race bookings. The winter and spring passed and nothing official had been communicated. But during the summer, a date for the rescheduled event was announced. 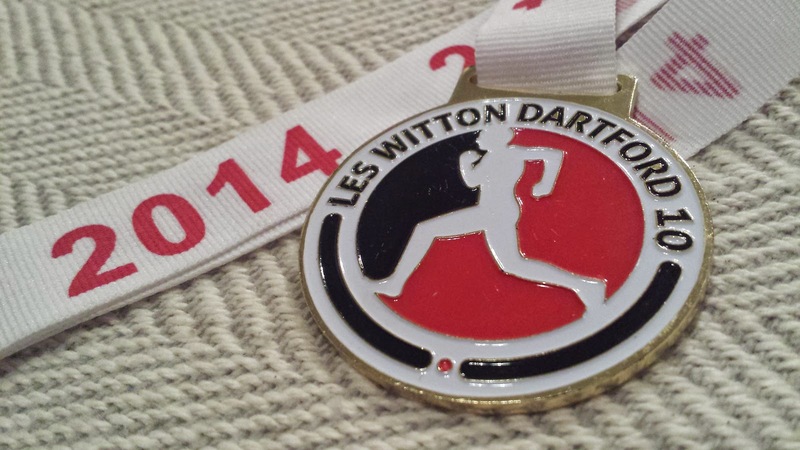 Sadly, along with the announcement came the news that this would be the last ever Les Witton Dartford 10 mile race. It's not often a race takes place within walking distance of home, so when it does, I like to enjoy the fact that I don't have to drive. 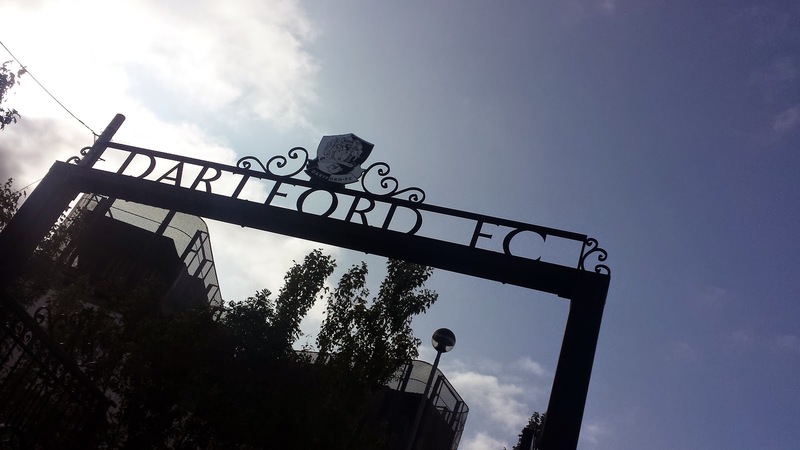 On the morning of the race, I jogged the 2.5km from home to the race HQ, which was within the grounds of Dartford Football Club, and collected my race number (349) with integrated timing chip. 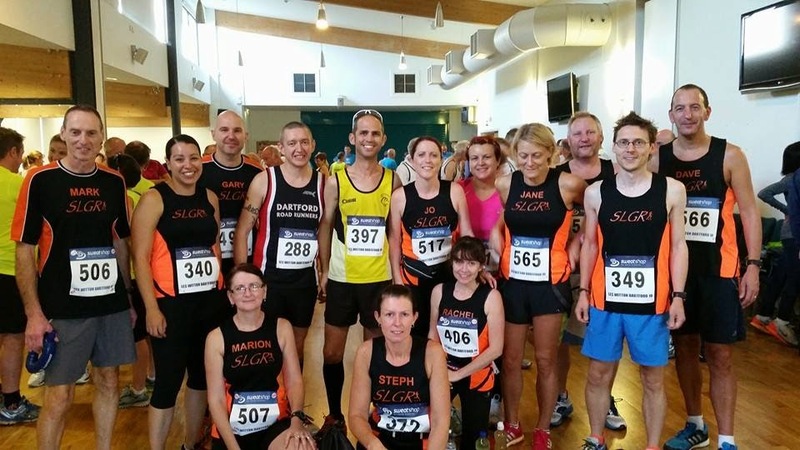 Since moving to Dartford I feel like I have become part of the local running community and it was no surprise to see many familiar faces, including a good turnout from my running club ‘So Let’s Go Running’ (SLGR). The race start time had been set for 8.30am, and at about 8.15am the 394 runners started to congregate near the start. I didn’t want to get caught too far back in the pack so I started just a few rows from the front, which worked out well. 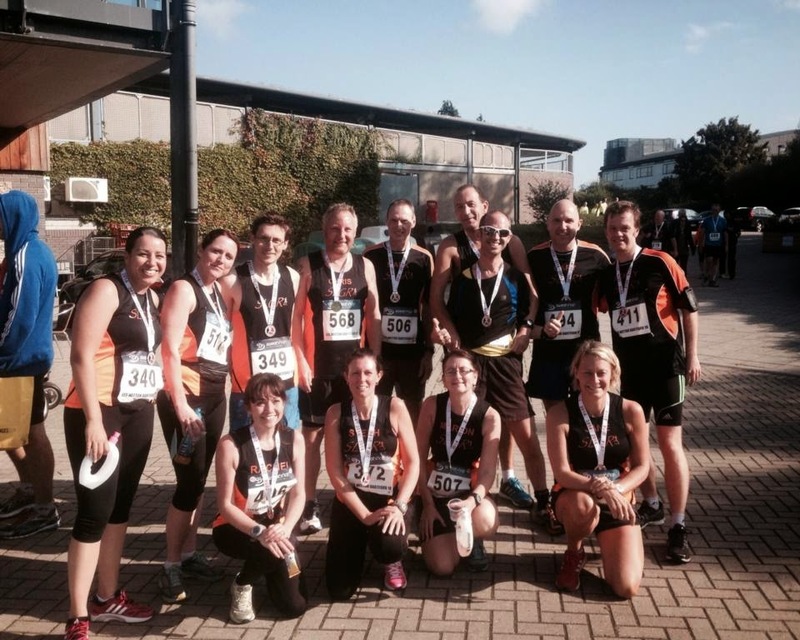 The race took place on undulating, and at times hilly, tarmac roads and pavements to the south of Dartford town centre and took in Darenth and South Darenth before heading back towards Dartford via Green Street Green. At 8.30am on the dot, the race was started. 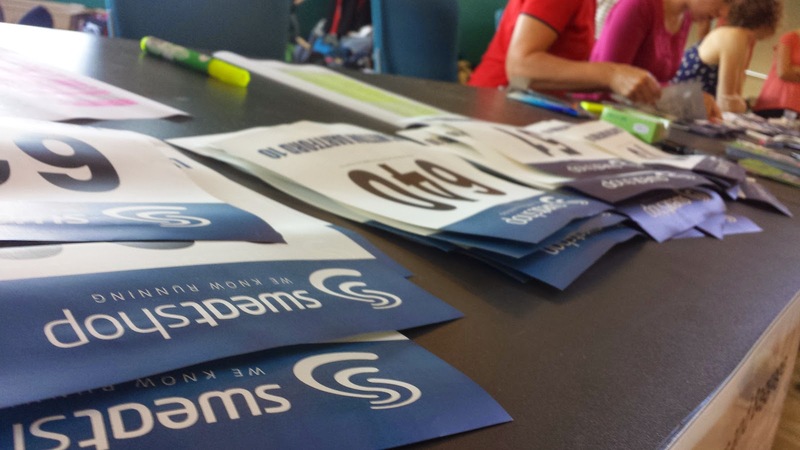 The opening section was slightly downhill and featured a few speed bumps – there were plenty of marshals warning the runners about these to ensure that nobody tripped. 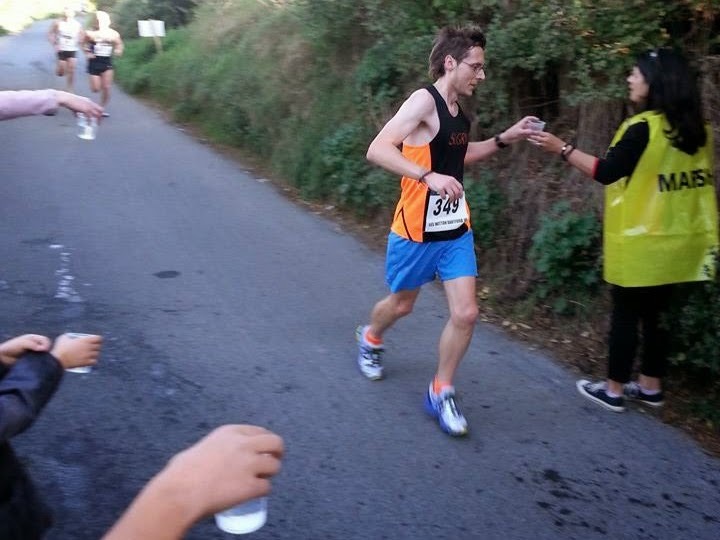 This lead into the steepest downhill section of the course which then levelled at the lowest point of the course (8 metres elevation) and eventually delivered the runners onto the A225 (Hawley Road), which had briefly been closed to the traffic heading south in order to allow the runners a safe passage. 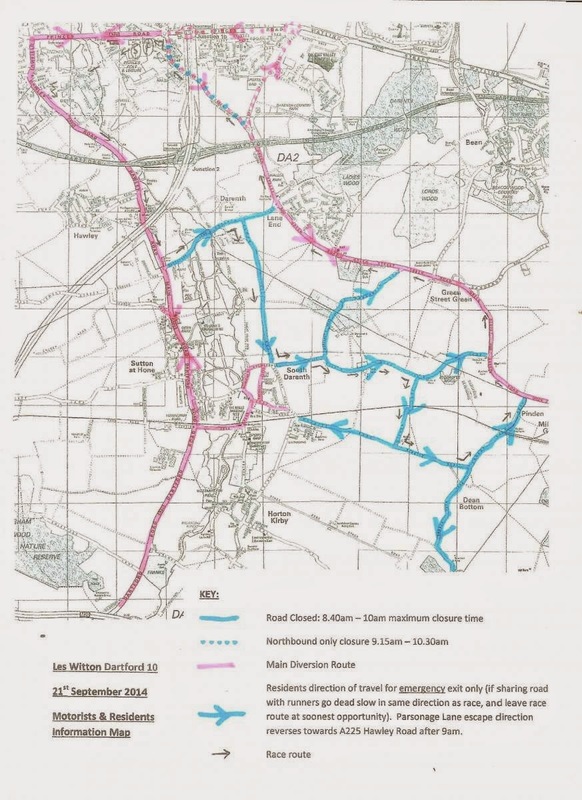 The first challenging hill came at the 3.5km point where we reached Darenth Hill, and just as you think you’ve reached the top, the course turned onto Roman Villa Road where the incline continued briefly. It is at this point where one of the finest views of the day was seen – Looking to the right the runners were able to see across the fields and back down into the Darenth Valley. The summit of this hill quickly lead into the second steep descent of the day where I spotted our SLGR club chairman out with his camera. The marshals were fantastic and I heard a lot of shouts of 'go Steve!' - they could of course have been for another Steve closeby, but I'll take what I can get! I had set myself the target of trying to reach the 15km point in under an hour. To do this I would need to run an average pace of just a smidgen under 4 minutes per kilometre. 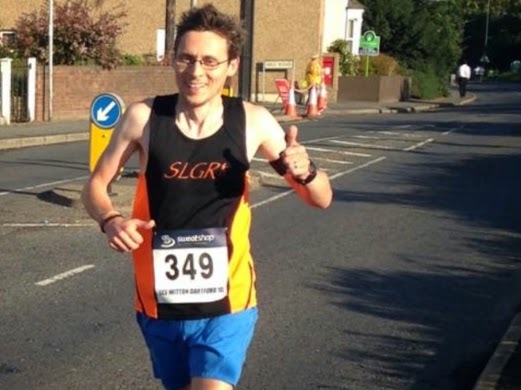 Once I had passed the 3 mile marker I kept glancing down at my Garmin until it showed 5 kilometres, which I reached in 19.45 – A few seconds ahead of target, which was good as I had got Darenth Hill out of the way and still stayed within the time goal. There were two water stations out on the course and the first one appeared around about here – I took some water at this point. 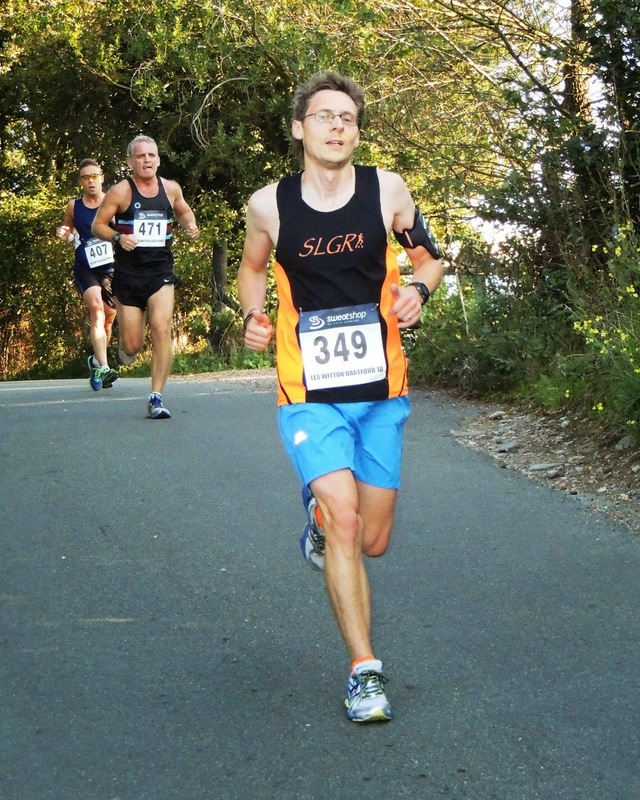 After this, the race entered a longer uphill drag with the runners tackling Holmesdown Hill before turning onto Gill’s Road and continuing the undulating climb up to the highest point (84 metres elevation) of the course at just after 5 miles (8.6 kilometres). Again there were nice views across the Kent countryside. I've forgotten my exact halfway time, but I'm pretty sure that my Garmin time had 33 at the beginning. The section between 9km and 15km is mostly flat or downhill. It started with me missing my 10k split but my GPS data suggests that it was just a smidgen under 40 minutes. A few metres after passing the 10k point, the route turned off of the quiet, closed country lanes and the runners now had to run on the pavement adjacent to Green Street Green. The pavement was a little uneven in places and it was along this stretch that I felt like I was having trouble maintaining my pace, but this was not the case as each time I checked my Garmin, the split remained fairly even at a pace either just below or bang on 4 minutes per kilometre. As I approached the 15 kilometre point, I knew that the final section would be tough. Awaiting the runners was Trolling Down Hill, which isn't that steep but at the end of a 10 mile race it isn't a welcome sight! During the hill climb I heard my Garmin beep at me to notify me that I had hit the 15 kilometre point, and glancing down I saw that my time was 59.50. I was pleased to have achieved my goal of hitting 15km in under the hour, but at that exact point the hill felt steeper, a headwind blew and again I felt like I was losing pace. Once at the top of the incline, the course went past my running club’s Tuesday evening meeting point at Leigh Technology College / Goals Football Centre, and then after turning left onto Princes Road (still on the pavement) the runners were directed through the Princes Road entrance to Dartford Football Club where the finish line, very nice bespoke medal, a banana and water awaited. After a brief recovery, I headed back over to the finish line to see if I could spot any familiar faces as they finished. The official results were published online later that day. 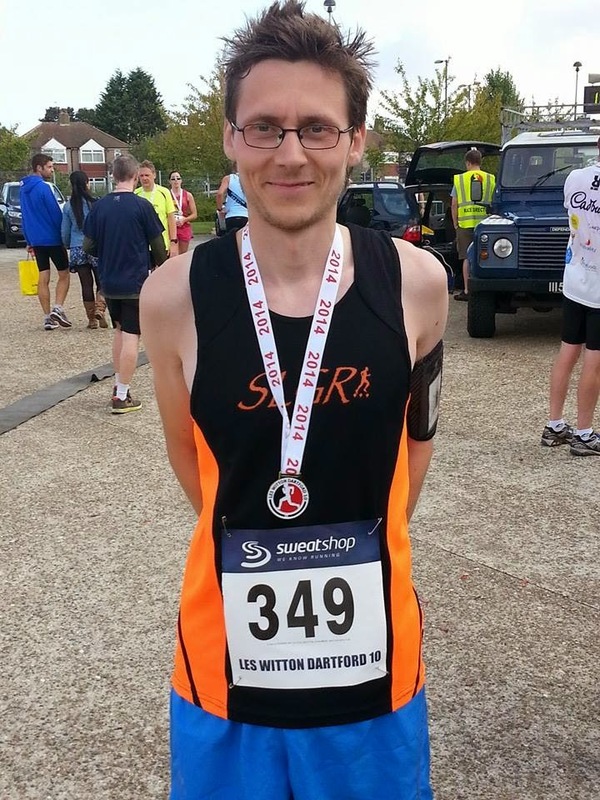 I finished in 33rd position in a time of 1:04.49 which was only 19 seconds off my 10 mile personal best that I had set earlier in 2014 at the Hildenborough 10. So considering this is definitely not a pb course, I was really pleased with my overall performance. I did unfortunately aggravate an old injury during the race and it looks like I'll have to make a few adjustments to my training for a bit; I have been neglecting the cycling lately and it's a good reason to get some decent mileage on the bike instead. Thanks to all of the marshals and supporters out on the course. I've used quite a selection of your photos here so thank you for sharing them (it's quite possible that I didn't ask if I could use them; I hope you don't mind). During the course of the morning I recognised so many faces from running clubs and of course from Dartford parkrun. Talking of parkrun, I counted three parkrun event directors taking part in the race - one of them even won a prize. 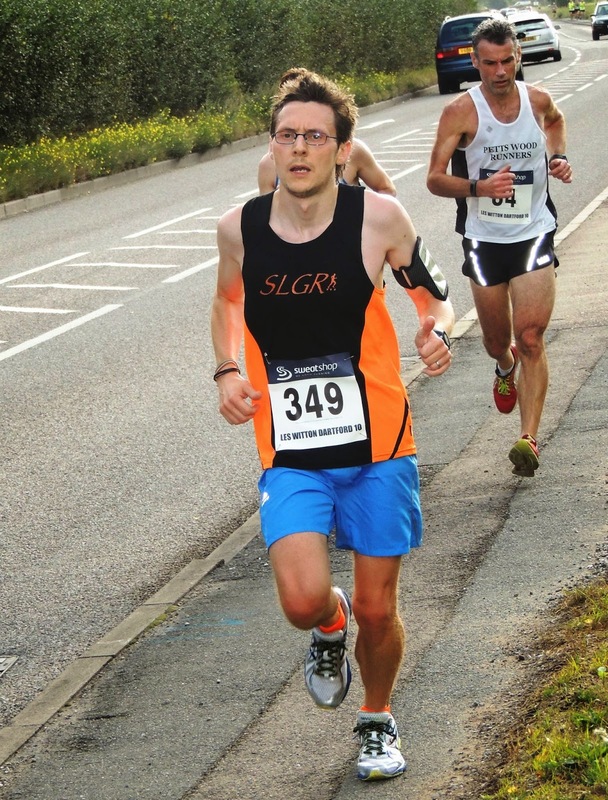 Overall a very enjoyable 10 mile race around the quiet country lanes. It's a shame that just as I have arrived in Dartford the race is disappearing. 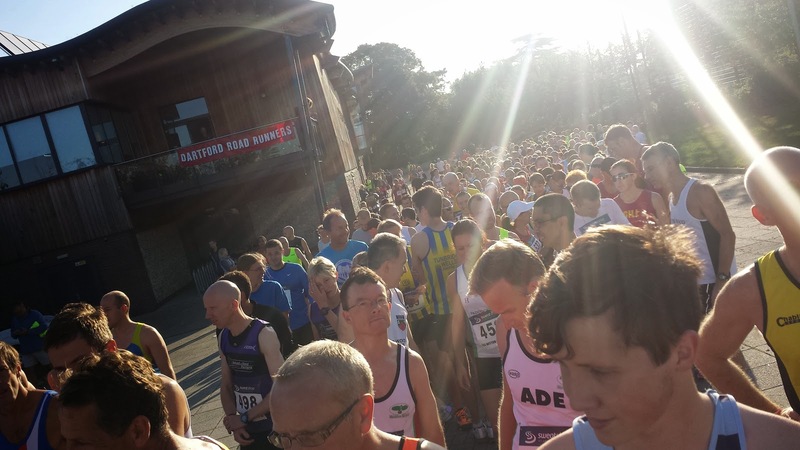 The good news, however, is that while this particular race has been consigned to the history books, Dartford Road Runners have hinted that something else will take its place but as of yet the details are unknown. One thing I do know is that with DRR behind it it's bound to be a great event.